Broccoli Cheddar Muffins: First things first! Happy 10th anniversary to my blog! Yay! It’s 10 years already!? It feels like yesterday that I managed to move the things from my oven which I was mostly using as a storage and bake my first eggless carrot banana cake and years have rolled by like it was fast forwarded or something! Hoping to have many more decades of eggless baking! 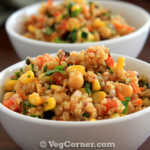 Today’s recipe is a savory muffins recipe! Yes it’s savory and not the usual fruits and nuts kind muffins which are all used to. I came across this broccoli cheddar muffins recipe when I was browsing Pinterest for recipe ideas to use the huge pack of broccoli florets which I had got from Costco. 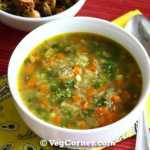 Variations of broccoli stir fry and vegan cream of broccoli soup are the most frequently made dishes with broccoli at our home and I was looking for something new and interesting. I have never baked savory muffins before and also the idea of adding broccoli to the muffins raised my curiosity. 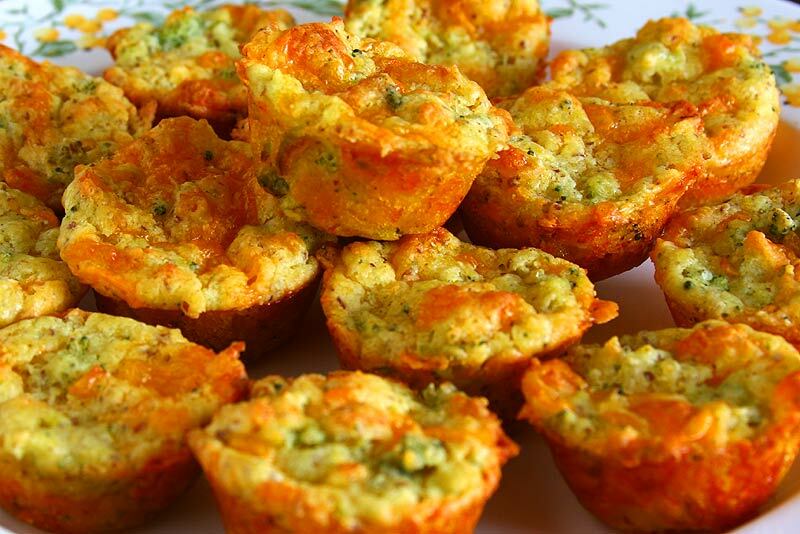 I looked further and found that these broccoli cheese muffins are perfect for toddlers as a healthy breakfast or snack. Coincidentally I had a set of twin one year olds visiting us and couldn’t have stumbled upon this healthy muffins recipe in a better time. 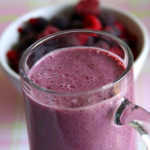 The original recipe was pretty simple and straight-forward to begin with except for the egg substitution I had to make. 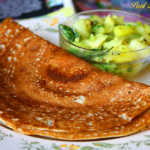 I felt using flax egg instead of the 1 egg in the recipe would be perfect. I increased the quantity of broccoli to 1 cup from half cup used in the recipe. Also the health nut in me was very close to substitute the all-purpose flour with whole wheat pastry flour but wasn’t sure how it will turn out so decided to use Bob’s Red Mill Gluten Free baking mix to make gluten-free broccoli cheese muffins! Those who haven’t used gluten-free baking mix, it’s very easy to use. 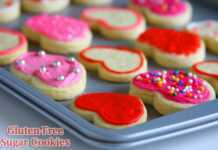 Simply substitute it for the regular all-purpose flour in a recipe measure to measure. 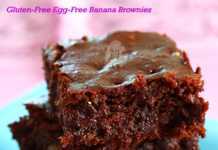 I have seen a lot of baking recipes using eggs with this gluten-free mix in various blogs and it turns out beautifully. They rise perfectly and everything, but because we are baking egg free too it’s sort of a hit or miss situation only. 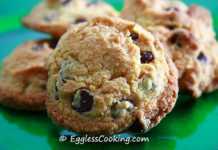 Learn more about gluten-free baking here. So I decided to bake these healthy broccoli and cheese muffins as mini muffins because I was making it for little kids and also I was using gluten-free mix. But sadly it didn’t rise as much as my gluten-free banana muffins but it tasted delicious nonetheless. I also reduced the quantity of sugar and added some turmeric powder and curry powder to make it less sweet and more savory. 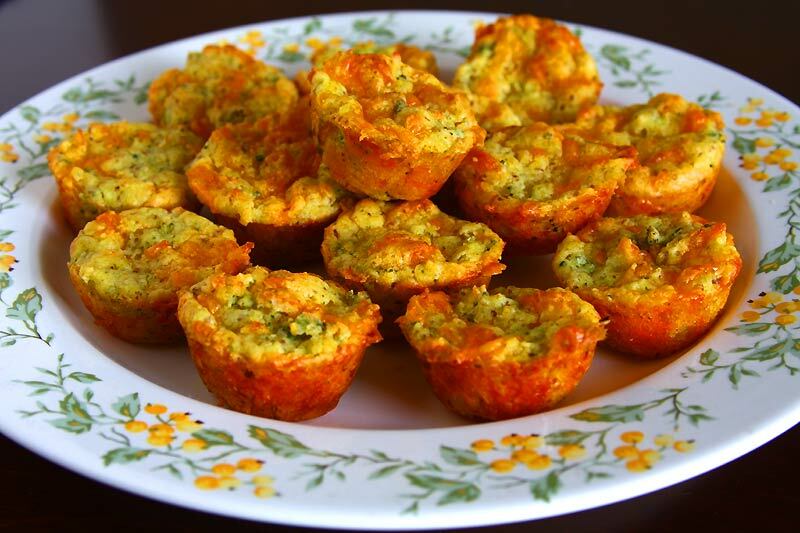 If you are making these healthy broccoli cheese muffins for breakfast for adults I would considering increasing the quantity of curry powder to spice it up. While these muffins were baking and when it was out the whole house was smelling like broccoli cheddar soup. Heaven! I guess I baked it a minute or two more so it had a crusty outer layer and soft inside which I’m not at all complaining. We loved it. My kids were gobbling it one after the other. In another bowl mix milk, flax egg and melted butter. Pour the wet mix into the dry mix and mix well. Grease mini muffin tin with non-stick cooking spray. Remove the muffin tin from the oven and place it on a wire cooling rack to cool before taking the muffins out. The original recipe had mentioned 1/2 stick butter which I misread as cup and had used 1/2 cup of butter instead of 1/4th of a cup which is 1/2 stick actually. So these muffins were rich and buttery. All that extra butter is not at all necessary. Just use 1/4 cup of melted butter and add couple spoons of milk if you find the batter sticky. Store the muffins in the refrigerator if you are planning not to consume it all within a day or two. Warm it up in the microwave for a couple of seconds if it’s cold. I’m sure freezing these broccoli cheddar muffins would work too. The nutrition information is based on 1/4 cup of melted butter not the 1/2 cup which I actually used.